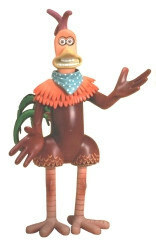 Playmates produced a significant number of "Chicken Run"
were produced, probably because of the disparity of size. There were three vehicular creations also available. None of these machines featured in the film, of course. figure and hence allowed folks to incorporate a "nemesis"
numbers than the other machines - D'oh! eyes blinked and his tail feathers ruffled as he "spoke"
could pick up an "intruder" from over 10 feet away. under - less than half its official retail price!